LOS ANGELES (MarketWatch) — Japan is going hydrogen, or so breathless reports over the past month suggest. Toyota Motor Corp. 7203, +1.75% TM, -0.10% which helped popularize hybrid vehicles with its Prius, is set to introduce a hydrogen-cell car for the masses — something which Toyota Chairman Takeshi Uchiyamada said could “change society,” according to a recent Nikkei Asian Review report. Unlike hybrids, which do emit carbon gases, or electric cars, which tap into grids often supplied by fossil-fuel plants, the hydrogen cell runs with just hydrogen (in its tank) and oxygen (from the air), with the only byproduct being harmless water. Toyota unveiled the concept version of its first fuel-cell mass offering — the FCV — over the summer. The company plans to launch it domestically sometime before the current fiscal year ends in March of next year, and in the U.S. and Europe by the summer of 2015. Of course, hydrogen-cell vehicles are already with us, but they’re generally used by fleets, such as city bus lines. The Nikkei report, for instance, notes that South Korea’s Hyundai Motor Co. 005380, -2.80% HYMLY, -0.01% sells a hydrogen version of its Tucson sport utility vehicle to the city of Copenhagen, among others. 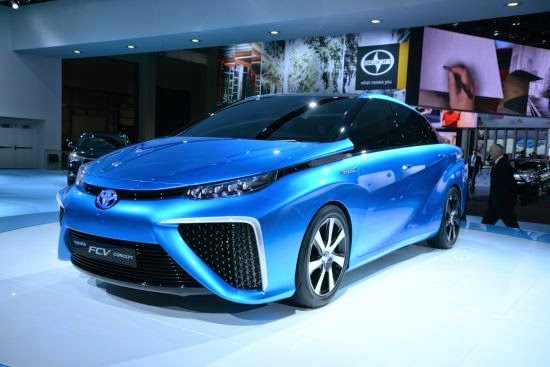 What makes the new Toyota hydrogen car different is the price. While the Nikkei says Hyundai’s hydrogen Tucson goes for about $145,000, Toyota has said its FCV will cost just 7 million yen, or a little over $67,000. “I could not believe my ears when I heard Toyota was thinking about selling its fuel cell vehicle for ¥7 million,” the Nikkei quoted an unidentified Hyundai executive as saying. Toyota’s competitors aren’t far behind either: Honda Motor Co. 7267, +1.41% HMC, -0.32% is also planning a consumer model for next year, while Nissan Motor Co. 7201, +0.85% NSANY, -0.52% is joining with Daimler AG DAI, +0.99% DAI, +0.50% and Ford Motors Co. F, -0.06% to produce a fuel-cell car for 2017, according to the Nikkei. Some obstacles remain, however, with the first and foremost being a lack of hydrogen fueling stations. According to a Wall Street Journal report, Japan currently has just about a dozen hydrogen stations. Toyota hopes to create a network of its own, with affiliate Toyota Tsusho Corp. 8015, +1.79% building the stations and French partner L’Air Liquide SA AI, +0.27% providing the fuel. Construction on the first Toyota Tsusho station began Monday, though the project is slated to yield just three locations over “the next several months,” the Journal said. And while the government is lending a hand, the Nikkei says, the entire nation is expected to have just 40 stations by the time the FCV goes on sale. As for foreign markets, the situation is mixed. The Journal report notes that green-friendly California has just nine hydrogen stations for cars and two for buses, although another 69 are under development. Meanwhile, South Korea’s total is expected to hit 43 by the end of next year, and Germany is shooting for 100 by 2017, it said. Price may also be a factor, with the Nikkei noting that $67,000 isn’t exactly cheap, even if it does bring the technology within the reach of average consumers. It quoted Prime Minister Shinzo Abe as saying last month that subsidies of “at least 2 million yen” per car would be made available, though Reuters reported at the time that the plan was only an outline, and details were still being finalized. Meanwhile, dealers who sell such vehicles will need to invest about ¥5 million for a device that can check for hydrogen leaks, the Nikkei said. Still, complimentary technologies could help make hydrogen cars more cost-effective. A separate Nikkei report out last month said Honda is making progress on using its FCX Clarity hydrogen-fuel-cell sedan to supply energy to a model home in Fukuoka. So instead of plugging in your electric car at home to charge it, you could plug in your hydrogen car to power your home. In fact, Toyota said back in January that a fully fueled FCV would be able to power a house for a week or to drive about 300 miles without refueling. And although the cars will likely remain more expensive than hybrids and electrics for the foreseeable future, the various reports on Toyota’s hydrogen ambitions suggest this won’t be a zero-sum game. The dawn of the automobile saw internal combustion completely crowd out electric cars, but the present situation may be more like the record player, which after World War II was able to support three different standards (33 RPM, 45 RPM and 78 RPM) seamlessly. I'm not suggesting that you purchase Toyota shares. This piece of news is interesting, one thing leads to another. The hybrid invention was just a transitional phase, the generation of battery-electric vehicles is almost reaching maturity, you can't squeeze more juice of out it. No 'substantial' battery tech breakthrough has been seen for the pass two decades. Gone are the days when oil was ~$140/barrel. With the shale oil revolution prices are plummeting. Now ~$80/barrel. India's and China's increased consumption won't help. Shale is being harvested everywhere; from US to Canada, Russia, Argentina and even Brazil. The United States by far the largest user of oil is now a net exporter of oil for the 1st time since 1949. Not good for crude oil producing countries, the black gold is starting to lose its glitter. That includes Malaysia, where Petronas is used as a piggy bank for the national coffer. That's why new taxes come in place to compensate for the loss of oil revenue. Bad news for Proton and Malaysians. We will continue to fund a worthless entity for decades to come. And we will continue to use internal combustion engines because we need to pay a humongous amount of money to get a FCV. Even a Hybrid is out of reach for many Malaysians. Hydrogen is easy to harvest via water-splitting or nano harvesting from the sun - virtually any country can do this. The Middle East OPEC countries will need to start thinking and planning ahead, oil dependence has to be reduced towards other sectors for a more lasting economic growth. Otherwise they will have to start to ride camels once again. Just like how combustion engines replaced horse wagons. There will be one day where a new tech eclipses the old. This may be it.